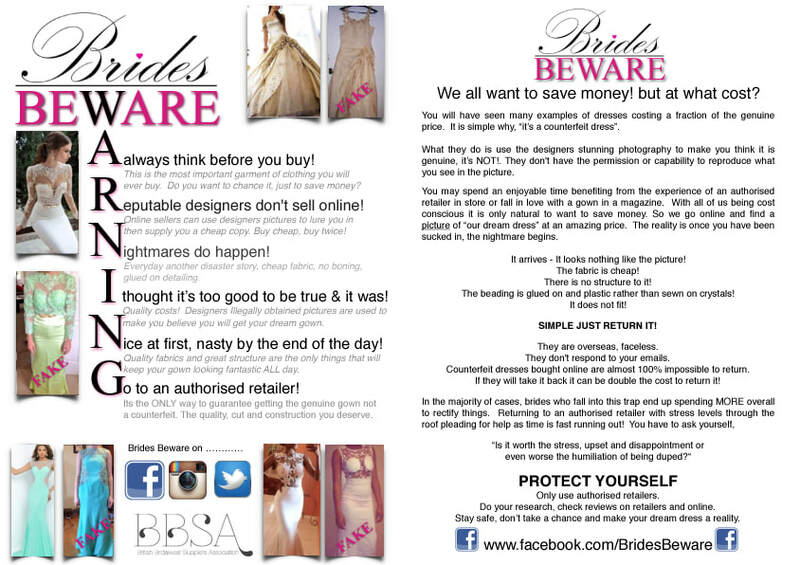 The BBSA (British Bridal Suppliers Association) set up the campaign Brides Beware in 2013 to help raise the awareness behind the risk of purchasing wedding, Prom and bridesmaid gowns online. The main message is that if you see a gown in a boutique for £800 and then see it online for £250 there will be a catch. The result is more often than not a substandard gown in poor quality fabric, a lack of underskirts and structure and dreadful beadwork. The main issue with these copycat websites is they are using photography owned by manufactures and designers, claiming that this is the dress the customer is purchasing. When really they are simply creating a substandard copy from the photograph. The campaign is helping to inform brides before they waste their precious wedding budget on a copied gown. The campaign currently has a Facebook page with over 25,000 followers, as well as Twitter and Instagram. There has been an overwhelming positive response from brides and retailers and the number of followers is growing each day. Brides Beware have exhibited at many bridal retail fairs and exhibitions across the UK over the past three years. It has had a fantastic response from the public. Also great support from the bridal industry press, with a number of features written about the campaign and even a feature on popular BBC television program Fake Britain. Please do not be tempted to buy online, after all who wants to purchase the most important garment they will ever wear from a stolen photograph. Do not be fooled into thinking you are buying the same designer gown online that you have tried on in a boutique, just be it’s the same photograph. Or worse still because they are claiming it’s the genuine designer by using their name. These Chinese factories steal the images from designer websites and use them to sell highly inferior copies. You are not cutting out the middle man by buying from these sites. Genuine Bridalwear designers and manufacturers never sell online in this way. Anyone that has been to try on wedding gowns, bridesmaid gowns or prom gowns will know how important it is to try on a number of different styles, see and feel the quality of the garment you are buying and use the expertise of a trained sales staff. Please consider how these gowns are being manufactured at these prices and how much the workers are actually being paid. Who is regulating the factories that these gowns are being made in and who is actually making them. Designer and manufacturers spend money and time sourcing factories and making sure the workers are well paid and fairly treated. Watch out for .co.uk websites, they are almost always still Chinese based. Some British based bridal shops are ordering in cheap copies themselves. Also people are setting up their on ‘businesses’ via Facebook ordering these dresses as passing them off as their own designs and sometimes even claiming they have made them. You cannot rely on just sending it back and getting a refund if you don’t like it. Most brides struggle to get any sort of refund and they are expected to pay to return the dress to China themselves. We have seen many with fake UK postal addresses and phone numbers. Enter the address into your search engine and see how many other similar sites are using the same address. If you are at all unsure just contact us via Facebook and we can give you some advice.